Scientists at Columbia University Medical Center (CUMC) have identified a factor in liver cells that is responsible for turning a relatively benign liver condition, present in 30 percent of U.S. adults, into a serious disease that can lead to liver failure. The study was published online today in Cell Metabolism. 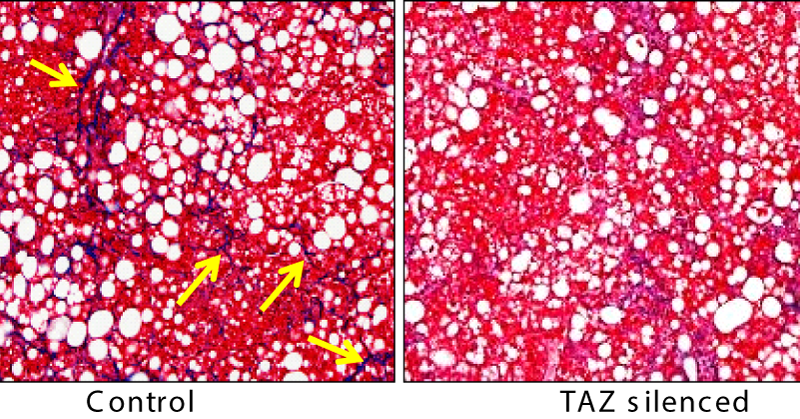 With the rise of obesity in the U.S., the incidence of nonalcoholic fatty liver disease (NAFLD)—in which excess fat fills the liver—has risen to epidemic levels. The extra liver fat is generally benign, but in one in five people, NAFLD evolves into a more serious condition, nonalcoholic steatohepatitis (NASH). In NASH, the liver becomes inflamed and criss-crossed by fibrous scar tissue, and liver cells start dying. Patients with NASH are at risk of liver failure and liver cancer, but there are no drugs on the market that can slow or stop the disease. Because the amount of fibrosis in the liver is associated with a greater risk of death from NASH, Xiaobo Wang, PhD, associate research scientist in the Department of Medicine at CUMC, looked for ways to stop fibrosis in a mouse model of NASH. He found that in liver cells, TAZ, a previously unknown factor in NASH, plays a critical role in initiating fibrosis, and that fibrosis stops in mice with NASH when TAZ is inactivated in liver cells. With TAZ shut down, existing fibers in the liver also dissolved, essentially reversing the disease. Two other critical features of NASH, inflammation and cell death, were also reduced when TAZ was turned off. Fat accumulation in the liver was unaffected. Based on their examination of liver biopsies from NAFLD and NASH patients, Drs. Wang and Tabas believe that TAZ works in the same way in people. "We think that by stopping fibrosis through TAZ and its partners, we may be able to prevent the serious consequences of NASH, including liver failure and liver cancer," said Ira Tabas, MD, PhD, Richard J. Stock Professor and vice-chair of research in the Department of Medicine and professor of pathology & cell biology (in physiology and cellular biophysics) at CUMC. The study is titled, "TAZ/WWTR1 Promotes Hepatic Inflammation and Fibrosis in Nonalcoholic Steatohepatitis."